The pottery of Iron Age Cyprus, i.e. of the Cypro-Geometric (CG), Cypro-Archaic (CA) and Cypro-Classical (CC) periods, represents an abundant archaeological record of the extant material culture. 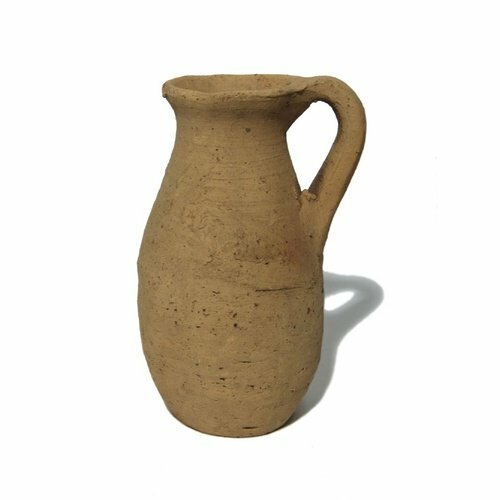 Ceramic vessels come from different archaeological contexts (tombs, settlements, and sanctuaries) of the Iron Age, which provide evidence for the production and use of pottery in the course of the 1st millennium BC. The pottery craft, which interests us here, when placed into its historical framework, should be considered in the context of the Iron Age polities. These are characterized by an uninterrupted occupation from the beginning of the Iron Age (the CG period) and they are defined as kingdoms from the end of the 8th century BC onwards until their abolition in the late 4th century BC, which signifies the end of the Iron Age.5 Thus, the pottery craft is to be studied as part of the social, economic and cultural environment of the Iron Age polities. 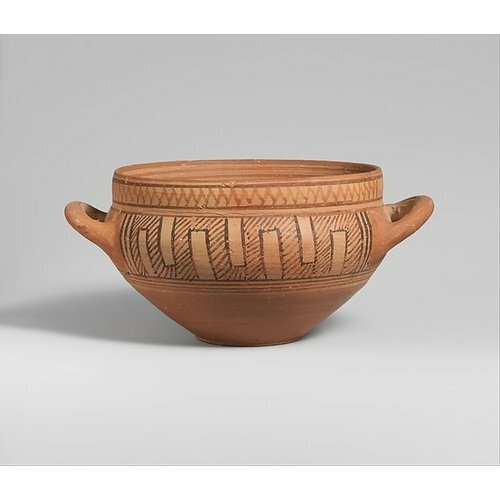 Based on the current state of research, this chapter provides an overview of the development of the Cypriote pottery from the mid-11th through the late 4th century BC by outlining its basic trends. To do so, it is necessary to firstly present the typo-chronological system, the principal tool for the reading of the pottery record of Iron Age Cyprus. The classification and dating of Iron Age ceramics are based on the typo-chronological system developed by Gjerstad in his work of SCE IV/26. Subsequently, this was slightly elaborated on by the same scholar.7 The Iron Age was, thus, divided into seven periods resulting from the definition of seven ceramic Classes or Types. In this classificatory system, the various shapes are classified according to the wares, i.e. the decorative techniques, which occur in each ceramic class. For example, White Painted I for CG I, White Painted II for CG II, and so on. The wares that appear in the course of one period are indicated by the number of their first appearance, accompanied by the number of the respective ceramic class in a parenthesis. The Black-on-Red, for instance, firstly occurred in the CG III period, is noted as Black-on-Red I (III) for the CG III, Black-on-Red II (IV) for the CA I, and so on. Nevertheless, recent studies have attempted to supplement the Cypriote character of the pottery craft, as it was defined by Gjerstad. This has been achieved through an approach of the pottery data in their regional context. Such a method has resulted in the identification of pottery production centres and definition of their respective ceramic styles. So far, for the CG period we can identify the pottery production of the workshops of Paphos, Kourion, Amathous, Kition, Lapithos, Salamis and Kythrea;9 in the CA period, the workshops of Amathous and Kition.10 Concerning the CC period, with the exception of a recent study on the classical pottery from Kition,11 the definition of the production of the various workshops still remains an open subject for research. Let us now turn to the presentation of the principal attributes of the Iron Age pottery of Cyprus according to the three factors making up a pottery style: shape, ware and decoration. We will then proceed with a synopsis per period of the most representative series of production by illuminating particular aspects of the regional workshops. In general, the composition of the different workshops’ repertoire during the Iron Age demonstrates local pottery traditions accompanied by elements borrowed from foreign ceramic fashions. 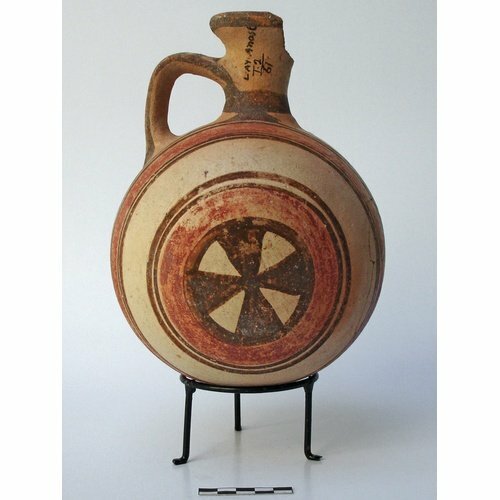 Cypriote potters were selectively incorporating new elements in their production, mostly concerning new shapes but also certain decorative motifs or even techniques. These external features were influenced by the imports attested on the island and following the tastes of the cosmopolitan society of Iron Age Cyprus. We acknowledge that they testify to the shifting trading patterns and contacts of the island with the surrounding regions of the Eastern Mediterranean, mainly with the Aegean and the Levantine coast. The several categories of vessels are, from a technological point of view, principally wheel-made, although there is some evidence for handmade vessels, in particular for large storage containers (pithoi) and for certain cooking pots.12 The production series are divided into two broad categories of closed shapes (vessels for stocking, transporting, serving and pouring) and open shapes (vessels for drinking, eating and serving), to which can be added the specific category of ritual vessels. The decorative techniques constitute another distinctive characteristic. 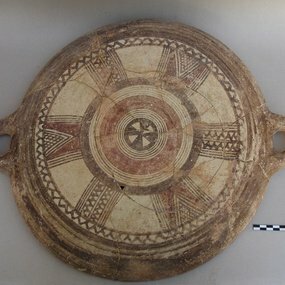 The wide range of fine painted wares fabricated by Cypriote potters throughout the Iron Age attests to their preference for colourful decorations on ceramics.13 Nevertheless, it is in the framework of the regional workshops that we can better perceive the degree of popularity of each ware, which in fact corresponds to a specific repertoire of shapes. In turn, the decorative ornaments are closely connected to the wares and each workshop employs a particular range of motifs. 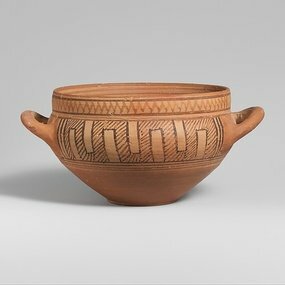 Finally, although vase decoration is mainly abstract, the pictorial representations compose a distinct category for the Cypriote Iron Age pottery which is not comparable to the pictorial styles established in the Greek Geometric, Archaic and Classical pottery. Indeed, the peculiarity of the pictorial scenes in the Cypriote pottery lies on iconographical and stylistic (general rendering and decorative techniques) grounds but also on the selected repertoire of vessel shapes.14 The pictorial tradition in Cypriote pottery is, therefore, best considered separately for each period and in the framework of the regional workshops. For the closed shapes in the CG repertoire, a representative vase of Aegean inspiration is the belly handled amphora. This vessel also stands out due to its long production during the entire Iron Age. However, it should be noted that in the course of the CG period the Aegeanising elements encompassed and further developed in the Cypriote production are detectable only as reminiscent, without having evidence of any new adopted features in the CG pottery. 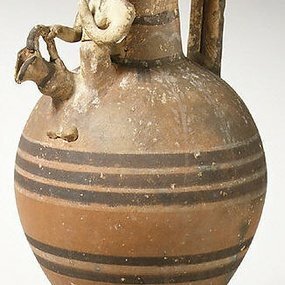 As for the Levantine inspired shapes, the flask and the globular jug are distinguished as the most abundant imports during the CG period and they were accordingly adopted into the Cypriote repertoire.17 Essentially, the globular jug, transformed in the Cypriote repertoire to a barrel-shaped jug, constitutes a very typical shape of the CG pottery [Fig. 1]. Among the open forms, a popular vessel is the plate. 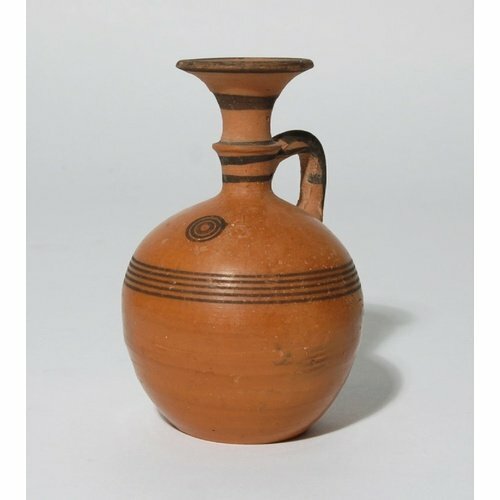 It is a specific shape of the Cypriote pottery which was produced only during the CG period [Fig. 2]. The plate is characterized by elaborate decoration on the exterior surface of its large base. 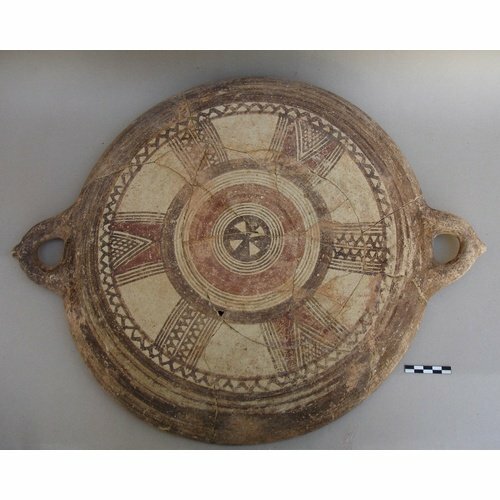 Towards the later stage of the Geometric period, the CG III period, two new wares make their appearance in the Cypriote production: the Red Slip (red coating of the vessel surface) and the Black-on-Red (black painted decoration on red background). 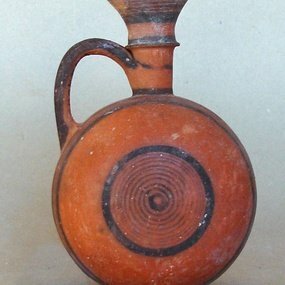 Although the Black-on-Red is one of the most debated wares in terms of its origin and its chronology, current research leaves no doubt as to its Cypriote origin.20 In addition, it has been recently suggested that the ware was an invention of the workshops of Paphos during the CG III period, where it also presents a high quality of manufacture [Fig. 3].21 The Black-on-Red occurs in a variety of shapes (open and closed), many of which were circulated in the Eastern Mediterranean, as we will see further on. In the CA period, novelties mark pottery production as evidenced in the different production centres. It is principally at the late phase of the period, the CA II, that the stylistic divergences between production centres become even more accentuated. Moreover, during the CA period, the production of different workshops is also marked by the enhancement of the use of pictorial scenes. 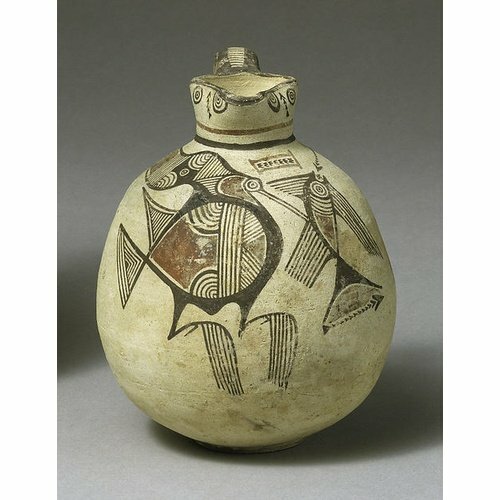 In the repertoire of shapes, we observe the stylistic development of pottery shapes already in circulation in the preceding period (the CG III), as well as the disappearance of others. A substantial change is, however, demonstrated by the adoption of new open shapes. Different types of bowls without handles executed in Plain White or Red Slip ware represent shapes of Phoenician origin and are widely documented in the production of the workshops of Kition.22 Furthermore, a new type of drinking vessel of Aegean derivation is also assimilated into the Cypriote pottery. It is a reproduction in White Painted and Bichrome ware of the skyphos vessel imported to Cyprus principally from Euboea and Attica during the 8th century and from the 7th century onwards from the East-Greek region.23 This vessel is closely related with the practise of banqueting [Fig. 4]. In the pottery of the Cypro-Classical period, the tendencies already apparent in the later stages of the CA II period continue and strengthen. Certain production series indicate a development of the pottery types with Levantine and Aegean, Attic but also East-Greek, stylistic “borrowings”. Yet, there are important fluctuations between the different production centers, a subject which still remains open for in-depth research. In the category of fine ware ceramics, the Plain White becomes a very popular technique. 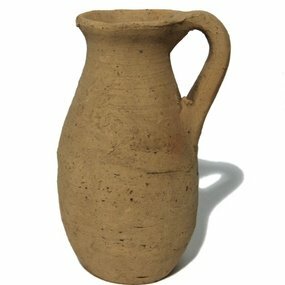 It is abundantly represented by a variety of jugs, in particular those which develop the shape of the dipper sack-shaped jug of Levantine origin, as well as by different types of handless bowls [Fig. 7]. Another important characteristic is the increasing tendency for the production of such vessel shapes in a miniature version, always in Plain White. Despite the diminished use of the painted wares in comparison with the CA period, it should be noted that the Bichrome Red ware stands out as the characteristic decorative technique of a special series of jugs. 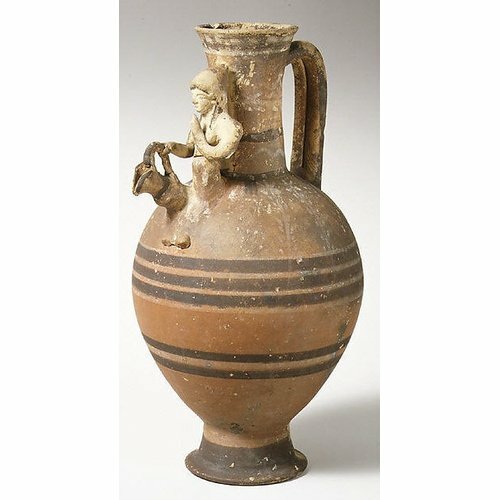 These jugs bear an attached animal protome or a terracotta female figurine holding a miniature oinochoe and particularly flourished in the workshops of West Cyprus in the late CA and especially during the CC [Fig. 8].31 Many specimens of this type of production are documented in the regions of Marion and Paphos. 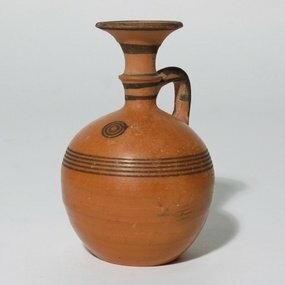 Moreover, in the beginning of the CC period a new ware appears: the Stroke Polished ware under Aegean influence.32 It is not a common technique and its use is, in fact, restricted to a range of shapes that have Greek counterparts. It seems that this ware is better represented in the western part of Cyprus. 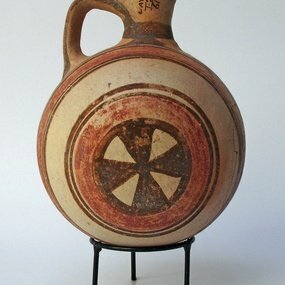 Regarding painted wares, in general terms, the ornamental repertoire encompasses selective motifs inspired from Greek, in particular Attic pottery styles, such as olive or ivy wreaths.33 Contrary to the CA period, the representations of humans and animals figures become very rare in the painted decoration the CC pottery. In concluding this brief summary of the 800 year-long evolution of pottery production in Iron Age Cyprus, it is important to note that new studies are required to define particular characters and aspects of the constantly increasing pottery record. However, it is clear that the Cypriote cultural identity, as manifested through the pottery craft, can be elucidated only in the frame of regional workshops of the Iron Age polities and it is within this focal area that new studies need to be rooted. Fig. 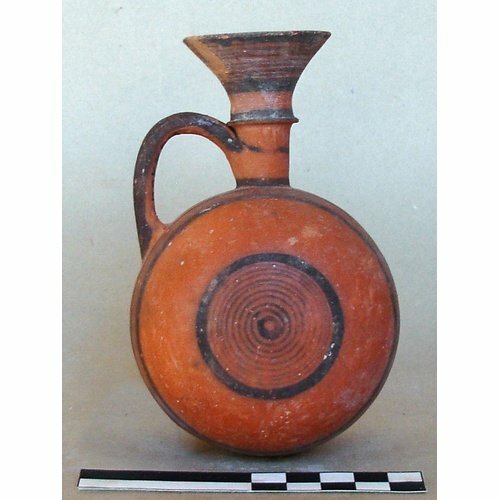 1: Bichrome II barrel jug (Georgiadou 2014, fig. 2). Fig. 2: Bichrome III plate (Georgiadou 2011, 178, fig. 21b). Fig. 3: Black-on-Red I (III) barrel juglet (Georgiadou 2014, fig. 3). Fig. 4: Bichrome IV skyphos. New York, Metropolitan Museum of Art 74.51.590. The Cesnola Collection, purchased by subscription 1874-76. Fig. 5: Black-on-Red II (IV) juglet. London, The British Museum, 1880,0710.86. Photo courtesy of © the Trustees of the British Museum. Fig. 6: Bichrome IV trefoil jug. New York, Metropolitan Museum of Art 74.51.527. The Cesnola Collection, purchased by subscription 1874-76. Fig. 7: Plain White VI/VII juglet. London, The British Museum 1887,0801.51. Photo courtesy of © the Trustees of the British Museum. Fig. 8: Bichrome Red VI jug. New York, Metropolitan Museum of Art 74.51.563. The Cesnola Collection, purchased by subscription 1874-76. 1 Such as the necropolis of Skales: Karageorghis 1983; the necropolis of Plakes: Karageorghis and Raptou 2014. 2 For example Karageorghis 1973. 3 Hadjisavvas 2012; Hadjisavvas 2014. 5 Satraki 2012; Iacovou 2013. 10 Amathous: Fourrier 2006, 2009; Kition: Fourrier 2015. 12 For the cooking pots : cf. Fourrier 2007. 13 For the definition and evolution of the various wares: Gjerstad 1948, 48-91. 14 For the corpus of the pictorial scenes on Iron Age Cypriote pottery: Karageorghis and des Gagniers 1974 and 1979. 15 Pieridou 1973; Iacovou 1988. 17 For the Phoenician imports: Bikai 1987. 22 For example: Fourrier 2015, 131-132, 135-136. 23 Coldstream 1979; Coldstream 1987. 24 For example: Bikai 1987, pl. X, XI. 25 Schreiber 2003; Bourogiannis 2012. 26 For the shape: Gjerstad 1948, Fig. LXIII, 10.2; Fig. LXIX, 3.2; also Gjerstad 1960, 120-121, fig. 15. 29 For the floral style in pottery and coroplastic art of Salamis: Yon 2005. 30 Fourrier 2008, with previous bibliography. 32 Gjerstad 1948, 84; Fig. LXI: Stroke Polished I (VI), Fig. LXVII: Stroke Polished II (VII). 33 Gjerstad 1948, 307, 310-311. 34 See for example Georgiou and Karageorghis 2013, 45-47. 35 For the shape: Gjerstad 1948, Fig. LXII, 4)4a, 5)4b; also Fourrier 2014, 135. Bikai, P.M. 1987: The Phoenician Pottery of Cyprus, Nicosia. Bourogiannis, G. 2012: “Pondering the Cypro‐Phoenician conundrum. The Aegean view of a bewildering term”, in M. Iacovou (ed. ), Cyprus and Aegean in the Early Iron Age. The legacy of Nicolas Coldstream, Nicosia, 183-205. Coldstream, J. N. 1979: “Geometric Skyphoi in Cyprus”, RDAC, 255‐269. Coldstream, J. N. 1987: “The Greek Geometric and Archaic imports”, in V. Karageorghis, O. Picard and C. Tytgat, La nécropole d’Amathonte ‐ Tombes 113‐367. II Céramique non‐Chypriote, Études Chypriotes VIII, 21‐31. Fourrier, S. 2006: “Les deux dépôts archaïques”, in S. Fourrier and A. Hermary, Amathonte VI. Le sanctuaire d’Aphrodite. Des origines au début de l’époque impériale, Études chypriotes 17, Athens, 49-126. Fourrier, S. 2007: “Le dépôt archaïque du Rempart Nord d’Amathonte V. Céramiques culinaires”, BCH 131, 67‐93. Fourrier, S. 2008: “Le dépôt archaïque du Rempart Nord d’Amathonte. VI. Vases du style d’Amathonte”, BCH 132, 555‐585. Fourrier, S. 2009: “Le dépôt archaïque du rempart Nord d’Amathonte VII. Autres productions chypriotes et importations levantines”, BCH 133, 67-93. Fourrier, S. 2014: “Appendix II. The Ceramic Repertoire of the Classical Period Necropolis of Kition”, in S. Hadjisavvas, The Phoenician Period Necropolis of Kition, II, Nicosia, 135-181. Fourrier, S. 2015: “La céramique chypriote et levantine des époques Géométrique et Archaïque”, in A. Caubet, S. Fourrier and M. Yon, Kition-Bamboula VI, Le Sanctuaire sous la colline, Lyon, 111-172. Georgiadou, A. 2011: “À propos de la production céramique Chypro‐géométrique d’Amathonte : essai de caractérisation”, CCEC 41, 167‐182. Georgiadou, A. 2013: La céramique de Chypre à l’époque géométrique: étude des ateliers régionaux (XIe-VIIIe s. av. J.-C.), unpublished PhD thesis, University of Aix-Marseille and University of Athens. Georgiadou, A. 2014: “Productions et styles régionaux dans l’artisanat céramique de Chypre à l’époque géométrique (XIe-VIIIe s. av. J.-C.)”, BCH 138, 361-385. Georgiou, G. and Karageorghis, V. 2013: A Cypro-Archaic Tomb at Xylotymbou and three Cypro-Classical tombs at Flasou: From exuberance to recession, SIMA CXL, Uppsala. Gjerstad, E. 1948: The Swedish Cyprus Expedition, The Cypro‐Geometric, Cypro‐Archaic and Cypro‐Classical Periods, IV, 2, Stockholm. Gjerstad, E. 1960: “Pottery Types: Cypro‐Geometric to Cypro‐Classical”, Opuscula Atheniensa III, 105‐122. Hadjisavvas, S. 2012: The Phoenician Period Necropolis of Kition, I, Nicosia. Hadjisavvas, S. 2014: The Phoenician Period Necropolis of Kition, II, Nicosia. Iacovou, M. 1988: The Pictorial Pottery of the Eleventh Century B.C. Cyprus, SIMA LXXIX, Göteborg. Iacovou, M. 2006: “À contretemps. Late Helladic IIIC Syntax and Context of Early Iron Age Pictorial Pottery in Cyprus”, in E. Rysted and B. Wells (eds. ), Pictorial Pursuits. Figurative Painting on Mycenaean and Geometric Pottery, Stockholm, 191‐203. Iacovou, M. 2013: “Historically Elusive and Internally Fragile Island Polities: The Intricaces of Cyprus’s Political Geography in the Iron Age”, in M. Iacovou et D. B. Counts (eds), New Approaches to the Elusive Iron Age Polities of Ancient Cyprus, BASOR 370 (2013), 15-47. Karageorghis, V. 1973: Excavations in the Necropolis of Salamis III, Nicosia. Karageorghis, V. 1983: Palaepaphos‐Skales. An Iron Age Cemetery in Cyprus (Ausgrabungen in Alt‐Paphos auf Cypren 3), Constance. Karageorghis, V. et des Gagniers, J. 1974: La Céramique de Style Figuré : Âge du Fer 1050‐500 av. J.‐C., Rome. Karageorghis, V. et des Gagniers, J. 1979: Supplement, La Céramique de Style Figuré : Âge du Fer 1050‐500 av. J.‐C., Rome. Karageorghis, V. and Raptou, E. 2014: Necropoleis at Paleapaphos from the End of the Late Bronze Age to the Cypro-Archaïc Period, Nicosia. Pieridou, A. 1973: Ο πρωτογεωμετρικός ρυθμός εν Κύπρω, Athens. Satraki, A. 2012: Κύπριοι βασιλείς από τον Κόσμασο μέχρι το Νικοκρέοντα, Archaiognosia 9, Athens. Schreiber, N. 2003: The Cypro‐Phoenician Pottery of the Iron Age, Leiden‐Boston. 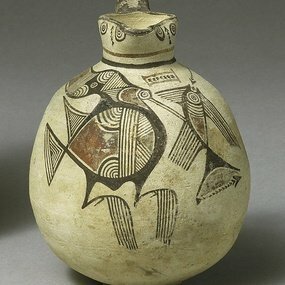 Vandenabeele, F. 1998: Figurines on Cypriote Jugs Holding an Oenochoe, SIMA CXX, Jonsered. Yon, M. 2005: “Peintres, potiers et coroplathes à Salamine. À propos d’une de statue archaïque en terre cuite”, CCEC 35, 35‐54. Fig. 2: Bichrome III plate (Georgiadou 2011, 178 fig. 21b). Fig. 6: Bichrome IV trefoil jug. New York, Metropolitan Museum of Art 74.51.527, The Cesnola Collection, purchased by subscription 1874-76. Downloading indicates your acceptance of Kyprios Character's terms and conditions of use.